I love music - I love listening to it, singing along, and I play a bunch of instruments too... and I love to share music and incorporate music with my second grade students. Plus, many of my friends have young kids and I know parents are always trying to find popular songs that are acceptable for their kids to listen to. When you look and listen closely to lyrics though, many are not acceptable, especially for younger elementary students. 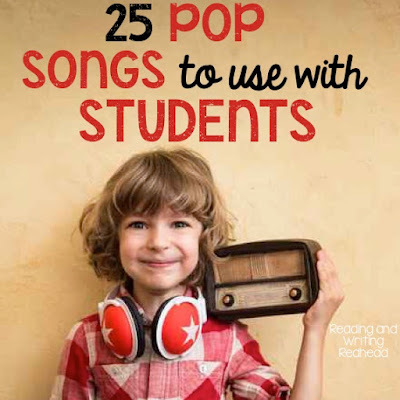 So, as a follow up to my previous blog post from a few years ago, 25 Pop Songs to Use with Students, I searched and found 25 more that will be okay for use with elementary school students or younger children. How did I find them? Well, I listen to lots of music so as I was listening to the radio the last month or so, I kept a running list of ideas on my phone. Then I looked up about 60 songs on AZ Lyrics to see which ones could make the list. I had to eliminate more than half for reasons like such as curse words which I didn't know about, or they were about romance. The lyrics needed to be applicable and/or acceptable to students. My disclaimer is pretty much the same as in my previous blog posts about using music in the classroom. 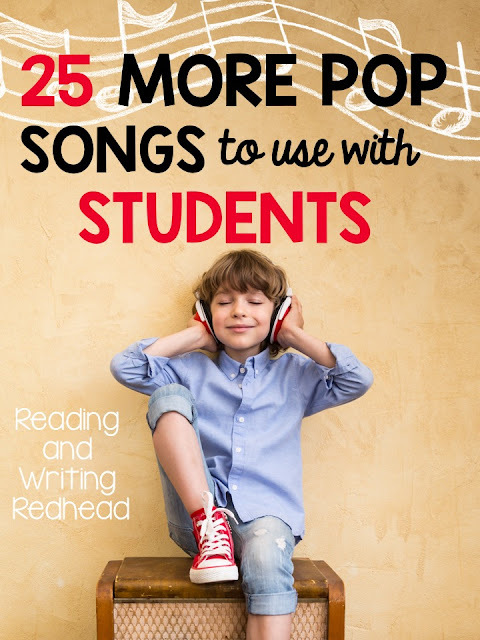 You should always listen to the entire song and read the lyrics yourself before playing it in class - the same thing you probably do when you play a video from Youtube for your students. And this list is for music only - I am not recommending playing any videos in class. I put the videos in the post so you can have a quick listen to the songs yourself only. For each song, I included a brief summary of my interpretation and anything I think you should know about the song. 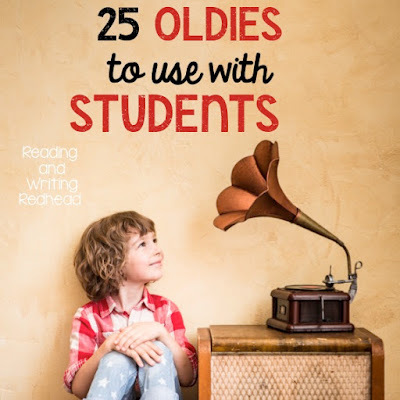 You might also like to check out my blog post called 25 Oldies to Use with Kids if you are also a music lover and if if you just want to mix it up! I really don't need to explain this one, right? Just listen and enjoy! The centuries in this song refer to how long the singer will be known. It's about being a legend beyond your own time. The video is also worth a watch. It's all about helping others and includes people who have faced hard times, those who come together to hep others, mentions of charitable organizations that you can donate to, and also includes Ed, a "schoolteacher who believes education matters". Preach, Gavin! This is a fun, upbeat song about traveling the world, meeting and befriending others, and living life to the fullest. The only caveat, is it may only be appropriate for older elementary students because of the line in the chorus: "I''m gonna live my life like I'm gone die young". It's awfully catchy though! If this one doesn't work your class, try their song "Best Day of my Life". This song is pretty much what the title implies - that even through hard times, we will be alright. It also talks about you can have some control over how things go by having a positive attitude and staying determined. This song was also featured in the movie Pitch Perfect 2, so if it sounds familiar, that may be why. It's another tune about someone who supports others and how that can help others remain strong in tough times. A lot of these songs seems to have this theme, don't they? I think things in our world are pretty challenging right now and that may be why so many artists put this theme into their songs. This song could apply to friendship, family, or a love relationship. You can also play the Hailee Steinfeld version, whom some students may be more familiar with. This song was pretty high on iTunes this week. I had never heard of them, but they are just getting famous thanks to their appearance on the reality show Boy Band. The song is about a love interest, but it also has the possibility of applying to anyone. The chorus is, "even with my eyes close you're beautiful" and "I wish you could see what I'm seeing'. Basically, what is inside is more important. This song! It does not sound like a country song - definitely more like a pop/dance song. And is all about (again) supporting another person and staying strong for them, to help them stay strong. This may be one of my favorites on the list! I don't think she had an official music video for this song, but this might be just right for you if you teach or live in NYC or New York, or if you are heading on a field trip! Sort of like with Frank Sinatra's New York, New York, it's all about the excitement of getting to the city and the possibilities of building a life here. You can also play the less dance-y, poppy version by Ryan Adams. He covered her entire album, 1989. This is a very fun , catchy song by the Avett Brothers who have had a following for a while (did you know the dog food line I and Love and You was named after one of their songs?) but hadn't become well known until now. The theme is about staying positive, sharing love and not letting anything hold you back. This song has been around a while but it's another one that might work in the classroom. In today's material - driven world, it's about focusing on happiness and joy (basically, in the form of "we just want to make the world dance"). You could play a version with or without the rap from B.O.B. depending on how you feel about it. Apparently I missed the update when Pink became P!nk but on her Vevo channel, she has the exclamation point. My interpretation is the song is saying if you are your unique, powerful self, you will be able to do amazing things, and reminds you to not let the haters get you down! Yes, this song is from the Moana soundtrack, but don't knock it. Cara is becoming a hugely popular singer and this song was in the iTunes top songs. This song is about being yourself and being true to what you love. It also reflects on the struggles so many of us have when we are torn between what our families and communities expect from us and what we really want to do with our lives. This meaning of this song is a little hard to figure out so I did some research. It is about a fight that singer Isaac Slade had with his brother and former fellow bandmate. One verse is told from each brother's perspective. Slade said sometimes you just have to fight things out with someone and that now "he's one of my best friends today". This song is, as you can tell, is a musical interpretation of Peter Pan and the Lost Boys and about finding a home and support from kind, friendly others. This song is unique because it's a young woman singing about being a lost boy, and a fourth grader sang a beautiful version of this at one of our school assemblies. This one is also about being confident and determined and is from the soundtrack of Descendants 2, which seems to have a lot of catchy, popular songs. She has a beautiful voice and unique style which is sort of a cross between pop and folk. The chorus is "The light from your eyes makes me feel like we were dancin' in the moonlight". Take a listen for yourself! It seems to be about having fun with friends and loved ones. This is a really fun song that has become really popular. If you read the lyrics, it is a little confusing by my interpretation is that it expressing one's feelings (good and bad) through writing and art and that his drive to succeed, life and love came from getting through the pain of the past. I did read that the lead singer has ankylosing spondylitis and depression which has caused him a lot of suffering for many years. His mental and physical health has done a 180 recently, however, which is why their new songs have a positive, powerful energy. The only caveat with this song is that there is a a lyric: "Oh let the bullets fly", however, the way the song is sung, it is really hard to tell. Up to you if you use it! Yes, another one by Imagine Dragons, because their new songs are terrific! Thunder is a great song which is basically about a comeback. The singer makes reference to being made fun of in school but now he is happy and loving performing on stage. This cute, fun song is about believing in yourself and going for your dreams! You don't even have to look up the lyrics because this creative video includes them! The video has a child's artwork with chalk lettered words and in it, the child becomes the superhero. Plus the song is uplifting and makes people want to dance! This is pretty much just a happy song, perhaps about coming out of tough times - or maybe Kelly had been feeling down and found new happiness in life. I think it was written when she was pregnant, so the heartbeat may have been that of her daughter, but it could have been interpreted as one's own heartbeat or that of any loved one. Like Welcome to New York, this would be great for those of you who live in a certain area- Boston or New England. The song is is a huge deal at Boston sporting events. The only caveat is that the sailor in the song lost his leg in an accident which is a little unpleasant, so the reason he is going up to Boston is to get his wooden leg. I hope you enjoyed this list and if you have any songs I should add to my next list, please let me know!